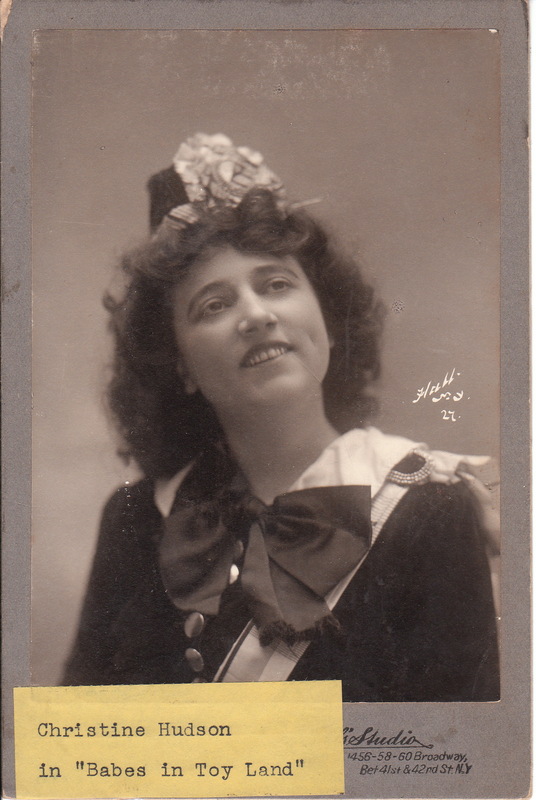 This Cabinet Card features stage actress Christine Hudson in costume for her role in “Babes in Toy Land”. The New York Times (9/10/1905) reports that the show was appearing at the West End Theatre and the cast included May De Sousa. An earlier edition of the New York Times (1902) announces her appearance in “Princess Chic”. The reverse of the cabinet card has an affixed label stating that the photograph is number H-16 of the “Oral M. Heffner Theatrical Collection” and the property of the Franklin County Historical Society. Research sheds some light on the Heffner collection. The Ohio State Archeological and Historical Quarterly (1953) writes that the first showing of the Oral M. Heffner Theare Collection was in 1953 and that the collection included over 700 rare photographs of early actors and actresses “who visited Columbus years ago”. The label on the front of this photograph blocks the name of the photographer. The name of the photographer etched on this image appears to be “Hall”. There was a Hall Studio located in New York City at a different Broadway address and it is possible that the studio was once at the Broadway address listed on this cabinet card. However, confirmation is needed and any verification help from a visitor to this site would be appreciated. To see other images by Hall, click on the category “Photographer: Hall”. To see other cabinet cards from the Heffner Collection, click on Cabinet Card Gallery’s category of “Oral M. Heffner Theatrical Collection”.